It starts as a solid piece of 1-1/4 M42 high speed steel and is machined to become a beast of a tool. Carter and Son Toolworks 1-1/4" roughing gouge is an impressive tool. The sheer mass and solidity cuts down chatter and gives you easy cuts, and the long strands of chips that will make any turner smile. Carter and Son's design and manufacturing department has been working hard on this new tool. Paul Carter, engineering team member and turner, notes that, "You can tell that a tool is made right when a single chip just keeps going. That is the kind of chips you get from this tool." David Carter believes, "our roughing gouge design is stronger and safer than any other." Every curvature and angle has been carefully thought-through and tested. As with every Carter and Son tool, the new roughing gouge is machined from M42 high speed steel, a premium grade of steel that contains 10% cobalt for a strong, long-lasting and razor-sharp edge. All Carter and Son's products are machined completely in the Seattle factory. The tools are manufactured from solid material, and are never formed into shape. 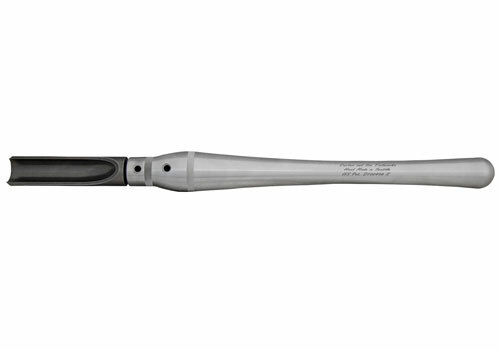 The roughing gouge is machined from solid 1-1/4 material, has a 3/4" tang, and is sold backed by Carter and Son's 16" aluminium handle or unhandled. Every Carter and Son tool is hand-polished and inspected and comes sharp and ready to use. As engineers and turners at Carter and Son proudly say: "our products represent American quality and workmanship."